The team is here to help before and during your stay. See you soon! 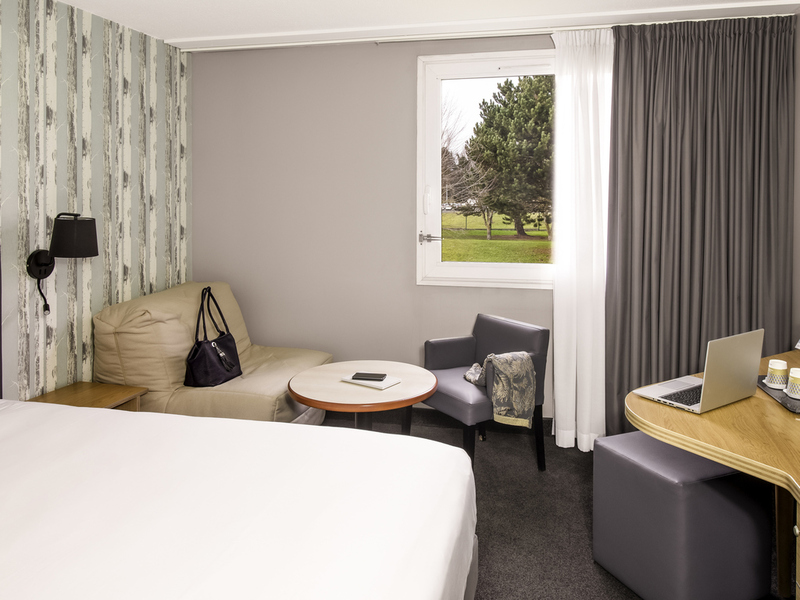 With great road transport links, and close to the tram station, this 4-star hotel offers spacious, air-conditioned rooms. Ideally situated within easy reach of the D-day beaches, a stay here is a great opportunity to explore the pearls of the Côte de Nacre. This is a perfect haven of peace and relaxation for business travellers and families alike. It is also a great venue for events and business seminars as well as for leisure activities. Our restaurant is open every day except public holidays, Friday evenings, and Saturday and Sunday lunchtimes.Light snacks are available at the bar or in your room. The modern "Le Resto d'à Côté" bar is open every day. The stay in the hotel room was fine but why wasn't I told there would be no dining room available when the hotel is surrounded by extensive road works making it difficult to walk anywhere for a meal. This was very poor - I think it is incumbent on the hotel to let us know. I had plenty of other communications about what it would cost and speedy check in!!! A quiet hotel on a Saturday night in December. Perhaps the most pleasant and friendly reception welcome we've ever had in an Accor hotel - five stars to the young lady who greeted us. A very pleasant and relaxing stay indeed. The staff were very welcoming and helpful, and the room was excellent. The airconditioning worked, too!! One of the friendliest and helpful receptions of any hotels we have stayed at. Despite a coach load of tourists enjoying the bar the hotel was surprisingly quite. Breakfast better than Ibis Styles and free for over sixties! Great experience we will stay here in future cheaper, better rooms and service than Ibis Styles in Ouistreham. Arrived at hotel and was greeted by freindly receptionist. Reception was clean and modern. Directed to our room which was ready at 14.00. We went to the bar during the afternoon and at the same time booked a table in the restaurant. The restaurant was very quiet only 4 tables had customers. I have to say the food was very good and I would not hesitate to recommend eating in the restaurant. The only to couple of thing I would mention is. We had a two course meal mine was starter and main my wife’s was main and desert. When my starter arrived so did my wife’s main and when my main arrived so did my wife desert. Really I should have had my start and we should have had our mains together a little thing I know but just seemed wrong. Also the price of drinks is way to high and prevented us from having more. Nothing any different to other hotels but it seems to me that hotels overpriced drinks which in my mind means less sales. A very nice stay in the hotel. Great beds and quite. Only thing missing, was at breakfast that there were no vegetables (being on a diet). Very convenient. Friendly staff, good room. Easy parking. All good. Friendly hotel, good food and comfortable rooms. Disturbed by doors and people in the corridor, both early morning and late at night - could hear everything as there is no sound proofing on the door at all. Delicious food in the restaurant and the room was otherwise nice. Needs more drinks facilities - the option to have one tea per daily stay is not enough. We arrived by car from the ferry and found the hotel very easily. The parking was convenient and the rooms and facilities excellent. We did not dine in the restaurant, but did enjoy a very good breakfast the following morning before checking out. There did appear to be a number of coach parties using the hotel, but these did not cause us any problems and had left before we breakfasted!! We enjoyed our one night stay here, having travelled on the ferry from Portsmouth to Caen, Ouistreham.